"Witan" redirects here. For other uses, see Witan (disambiguation). The Witenaġemot (Old English witena ġemōt Old English pronunciation: [ˈwitena jeˈmoːt] modern English /ˈwɪtənəɡəˈmoʊt/ "meeting of wise men"), also known as the Witan (more properly the title of its members) was a political institution in Anglo-Saxon England which operated from before the 7th century until the 11th century. The witenagemots did not represent the political will of all England: before the unification of England in the 10th century, separate witenagemots were convened by the Kings of Essex, Kent, Mercia, Northumbria, Sussex and Wessex. The Witenagemot was an assembly of the ruling class whose primary function was to advise the king and whose membership was composed of the most important noblemen in England, both ecclesiastic and secular. The institution is thought to represent an aristocratic development of the ancient Germanic general assemblies, or folkmoots. In England, by the 7th century, these ancient folkmoots had developed into convocations of the land's most powerful and important people, including ealdormen, thegns, and senior clergy, to discuss matters of both national and local importance. But the word carries with it, however unjustifiably, a fustian air of decayed scholarship, and, in addition, its use may seem to prejudge the answer to an important question: do we have here an institution, a capitalized 'Witan', as it were, or merely a lower-case ad hoc gathering of the wise men who were the king's councillors? For these reasons, in his study of the origins of the English parliament, he generally preferred the more neutral word 'assembly'. He described 'witena gemot' as a rare eleventh century usage, with only nine pre-Conquest examples, mainly in the crisis of 1051-52. Patrick Wormald was also sceptical, describing 'witena-gemot' as "a word always rare and unattested before 1035". Despite historians' best efforts to find in it some permanence of character, the exact nature of the witenagemot remains "essentially vague, fluctuating, and incoherent." Nevertheless, there is much direct evidence of the witan's various activities. Knowledge about who made up the witan and who was present at their meetings is provided mainly by lists of witnesses to charters, or grants of land, which were concocted at the witenagemots. Reference to the witan's acta or official decisions are also preserved in law codes. The first recorded act of a witenagemot was the law code issued by King Æthelberht of Kent ca. 600, the earliest document which survives in sustained Old English prose; however, the witan was certainly in existence long before this time. Altogether, about 2000 charters and 40 law codes survive which attest to the workings of the various meetings of the witan, of which there are around 300 recorded. These documents clearly indicate that the witan was composed of the nation's highest echelon of both ecclesiastical and secular officers. Present on the ecclesiastical side were archbishops, bishops, and abbots, and occasionally also abbesses and priests; on the secular side ealdormen (or eorls in the latter centuries) and thegns. Members of the royal family were also present, and the king presided over the entire body. I have not thought it necessary to discuss at length the nature of the powers possessed by the council [i.e. the witenagemot], for .. there can be little hope of arriving at any definite conclusions on this subject. Indeed it seems at least doubtful whether the functions of the council were ever properly defined. From the time of Ine the Witan was composed of the aristocratic élite created by monarchy. The king, generally indeed advised by the existing nobility, conferred prelatures and ealdormanries, with both of which a seat in the national assembly [i.e. the witenagemot] was legally or practically connected. Members of the royal family, ladies not excepted, were present at many gemots. The king alone raised a man to the position of a gesith, a thane, a provincial or local reeve, a court officer or a royal chaplain, one of which titles seems to have been the indispensable qualification for a vote. .. as no periodicity of the assembly was fixed, the king determined when and where it was to meet, for the most part choosing places under his immediate control; he presided, spoke first, put his questions, proposed his bills, and finally dismissed the witan. The influence of the king, or at least of kingship, on the constitution of the assembly seems, therefore, to have been immense. But on the other hand he (the king) was elected by the witan .. He could not depose the prelates or ealdormen, who held their office for life, nor indeed the hereditary thanes. .. At any rate, the king had to get on with the highest statesmen appointed by his predecessor, though possibly disliked by him, until death made a post vacant that he could fill with a relation or a favourite, not, however, without having a certain regard to the wishes of the aristocracy. In addition to having a role in the 'election' of English Kings, it is often held that the witenagemots had the power to depose an unpopular king. However, there are only two occasions when this probably happened, in 757 and 774 with the depositions of kings Sigeberht of Wessex and Alhred of Northumbria respectively. The witan's powers are illustrated by the following event. In the year 1013 King Æthelred II fled the country from Sweyn Forkbeard, who then had the witan proclaim him king. 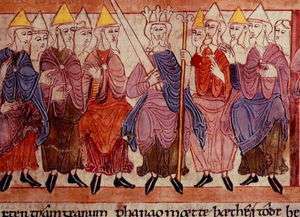 Within a few weeks, however, Sweyn died and Æthelred was called back to England by the witan. According to the Anglo-Saxon Chronicle, the witan would only receive him back under the condition that he promise to rule better than he had. Æthelred did so, and was reinstated as King of England. His nickname of the 'Unræd' or 'Unready' means ill-advised, indicating that contemporaries regarded those who sat in the witan as in part responsible for the failure of his reign. Victorian notions of a national 'witan' are crazy dreams without foundation, myths of a 'democratic parliament' that never was. Witans would advise on the administration and organization of the kingdom, dealing with issues such as taxation, jurisprudence and both internal and external security. The witenagemot was in many ways different from the future Parliament, it had substantially different powers and some major limitations, such as a lack of a fixed procedure, schedule, or meeting place. The witan could seek to prevent autocracy and carry on government during interregnums, but ultimately the witenagemot answered to the king. It only assembled when he summoned it, and its assembling without his approval could be considered treason. The witenagemot was more an advisory council. In some cases, weak kings (such as Ethelred the Unready) were dependent on the witenagemot, while others used it as simply a group of advisers. Though no set date was ever in use, witenagemots met at least once a year, and commonly more often. There was no single seat of a witenagemot, it being held where the king was, who typically had no single fixed court either. Witenagemots are known to have met in at least 116 locations, including Amesbury, Calne, Cheddar, Gloucester, London and Winchester. The meeting places were often on royal estates, but some witenagemots were convened in the open at prominent rocks, hills, meadows and famous trees. This arrangement ended when the Normans invaded in 1066, replacing the witenagemot with the curia regis, or king's court. However, in a sign of the witenagemot's enduring legacy, the curia regis continued to be dubbed a "witan" by chroniclers until as late as the 12th century. It is generally accepted that the English witenagemot had its origins in ancient Germanic assemblies summoned to witness royal grants of land. Yet whatever their status in the 5th and 4th centuries, the nature of these assemblies in England was irrevocably changed when Christianity was introduced, circa 600. Hereafter, church and state were "inseparably intertwined," and this was reflected in the strong ecclesiastical element in the witan's membership and concerns; records of decisions made by witan encompass ecclesiastical and secular jurisdictions alike. The Wizengamot, a fictional organisation in the Harry Potter series of books written by J.K. Rowling, derives its name from the Witenagemot. In the books the Wizengamot is a wizard council and court, of which Albus Dumbledore is a senior warlock. He is temporarily thrown out when he speaks of Voldemort's return. The Entmoot in J.R.R. Tolkien's The Lord of the Rings uses the same root word as the folkmoot. Wikisource has the text of the 1911 Encyclopædia Britannica article Witan. ↑ Hodgkin, History of England, p. 232. ↑ Chadwick, Anglo-Saxon Institutions, p. 308. ↑ Liebermann, The National Assembly, pp. 4-5. ↑ Chadwick, Anglo-Saxon Institutions, p. 355. ↑ Liebermann, The National Assembly, p. 2. ↑ Liebermann, The National Assembly, pp. 19-20. ↑ Chadwick, Anglo-Saxon Institutions, pp. 357-58. ↑ Liebermann, The National Assembly, p. 21. ↑ Quoted in Whitelock, Review of The Witenagemot in the Reign of Edward the Confessor, p. 642. ↑ Chadwick, Anglo-Saxon Institutions, pp. 362-63. ↑ Garmonsway, The Anglo-Saxon Chronicle, p. 145. ↑ Benjamin Thorpe (1840). Ancient Laws and Institutes of England: Comprising Laws Enacted Under the Anglo-Saxon Kings from Æthelbirht to Cnut, with an English Translation of the Saxon; the Laws Called Edward the Confessor's; the Laws of William the Conqueror, and Those Ascribed to Henry the First. p. 317. ↑ David Sturdy, Alfred the Great, (Constable, 1995) p. 124. ↑ Liebermann, The National Assembly, p. 13. Chadwick, H. M., Studies on Anglo-Saxon Institutions (Cambridge, 1905). Garmonsway, G. N. (ed. & trans. ), The Anglo-Saxon Chronicle, 2nd edition (London, 1954; repr. 1965). Gomme, George L., Primitive Folkmoots; or, Open-Air Assemblies in Britain (London, 1880). Hindley, Geoffrey (2006). A Brief History of the Anglo-Saxons. London: Robinson. Liebermann, Felix, The National Assembly in the Anglo-Saxon Period (Halle, 1913; repr. New York, 1961). Thorpe, Benjamin (2012) . Ancient Laws and Institutes of England: Comprising Laws Enacted Under the Anglo-Saxon Kings from Æthelbirht to Cnut, with an English Translation of the Saxon; the Laws Called Edward the Confessor's; the Laws of William the Conqueror, and Those Ascribed to Henry the First. p. 317. Whitelock, Dorothy, Review of The Witenagemot in the Reign of Edward the Confessor by Tryggvi J. Oleson, The English Historical Review 71 (1956): 640-42. Roach, Levi (2013). Kingship and Consent in Anglo-Saxon England, 871-978: Assemblies and the State in the Early Middle Ages. Cambridge, UK: Cambridge University Press. ISBN 9781107036536.